Cross domain tracking needs to be made easier. Teachers want to be able to provide individual questions for individual students, change the scoring system on the fly. Teachers want to track specific skills more so than trainers would in a company. Teachers want to be able to re-arrange content on the fly. A standard for export tracking from one LMS to another would be useful. Should be able to track from two activities to one training record, eg: mobile and desktop versions. Need to detect role when launching content (teacher or student). And for students, their level. TinCan: Could you describe your role in your organization and specifically how you’ve used e- learning and standards or your use of e-learning? José: My role at Netex is I’m the CEO. Netex is an e-learning company, specializing in the Spanish side, in both sides of the SCO, both in terms of content and in terms of LMS development solutions. So we are working very closely, especially with the SCORM standard, of course, AICC, and the other e-learning standards. We are very close to the standard because we have to work from the content side, and from the LMS side. So here at Netex, we have around 120 people, the knowledge of SCORM is mandatory for everyone. TinCan: So I guess this is going to be more towards the content side, but what are you doing in your training now that is new or innovative? José: Since last year, we’ve been developing, our last project, with schools here, I would say more than five-hundred schools, and every school has an LMS, especially Moodle. 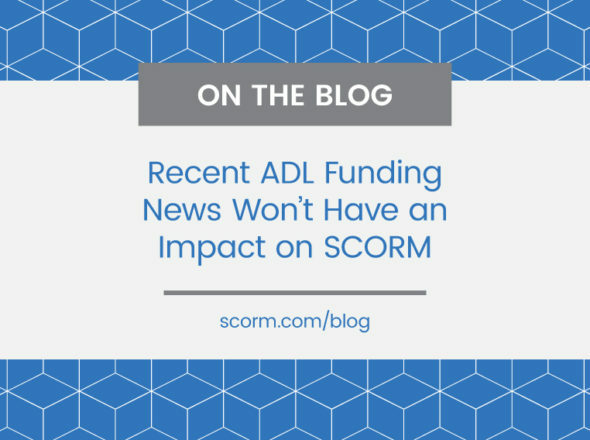 I know they have some other platforms, but SCORM was mandatory for all of them. The question here was in terms, especially for the content — the content was in one place, on our servers. The problem was, in terms of how to, implement SCORM when the content was still in one server and the LMS was in many other colleges with a different domain name. For instance, the big issue was to create models like you have to deliver the content in a SCORM format from a different server. So that was the main issue we have, in terms of how the content should be distributed and accessed initially from our school of 500 or 1,000 students, and implement the SCORM correctly with tracking. A complex tracking, in terms of iterations, how many different aspects of the content, in terms of tracking the different activities the students should do, and in terms of how the teachers should interact or share the tracking. The current tracking the SCORM provides was not enough, in terms of complexity, in terms of the teachers not getting what they expect, in terms of how to change the students tracking and progress, etc. So that’s been an issue because we want to make it easier in terms of making SCORM more easy to understand in schools, and more accessible for distributed content, and providing some kind of DRM because the publisher and our major customers don’t provide some kind of licensing system. So those are the things we want to convey in the next version of SCORM or something like that. TinCan: So you mentioned with distributed content across different domains, different DNS, that you have a cross-domain issue that so many people have run into. Also, you mentioned that you have some very complex tracking. Can you describe more what sort of things you were trying to track? José: The current SCORM, many of these schools we are working with have with Moodle, but many didn’t. When the teacher tried to understand the progress with the SCORM standard, we had some limitation. Because it’s content especially created for an individual tracking. So when the teacher tried to interact with a student, SCORM didn’t report anything. For example, we created very complex content with a lot of interactions in terms of questions and answers, so if the teacher wanted to change the scoring system, that was an issue. You create the calls, and say okay, you can make different calls for different questions, but it is not easy for the teacher to provide individual questions for individual students, change the scoring system on the fly. These kinds of aspects, they need to be more flexible. TinCan: So when you say change the scoring system on the fly, does that mean after the student has actually started taking the course? José: That’s one example, the other one should be for instance, from the content itself, you want to create some content to go to a different back-end, that is not SCORM, that is an issue. Because you have to go away from the SCORM and then go back easily, or try to access different services from the content itself, like social websites or mashup sites, without losing your tracking in those specific fields. So maybe it’s something that web services from the content itself could fix. TinCan: Are you familiar with the LETSI run-time web-services? José: I think it is a good idea, in terms of creating a web services API, to make the tracking system more accessible. José: We also noticed a difference — when we are talking about LMS for corporations or organizations and we tried to apply this SCORM concept to the schools, and many times the teachers and students aren’t using the LMS, it’s very different from the corporate perspective, of course, but the way teachers want to interact with the students, sometimes SCORM is more like a barrier,something we have noticed. Because the teacher wants to create a task for the student, and track it everyday. 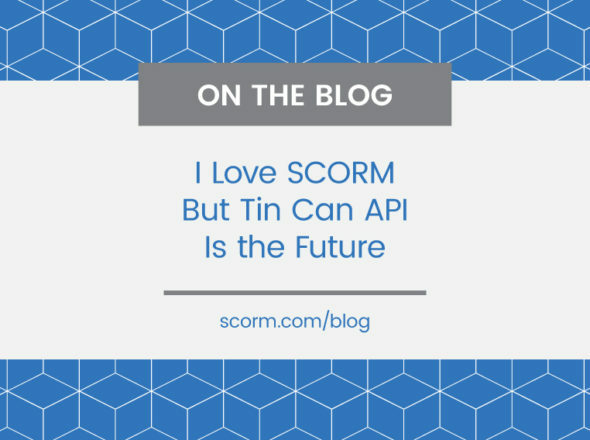 TinCan: So SCORM is getting in the way, doesn’t work well, when they want to track day to day assignments and not the sort of lesson and test at the end model that is done more in the corporate environment? Is that what you’re saying or am I missing something? José: Yes, it’s because I think the tracking in the SCORM standard was created specifically for the individual tracking and sometimes the tracking and now the kind of schools we are facing right now are not publishing different resources for the students in class, and so most of the time to model this kind of interaction with SCORM, but many is not enough. We don’t know how to explain that, but the way the teachers want to use the prototype, you want to create your class with students, creating an activity that is really homework for students, and many times he wants to track language skills, writing skills, and sometimes those kinds of interactions that you have in SCORM don’t support the required activities, the tracking the teacher wants to do. Of course, in a company, you don’t want, you don’t want to track a specific skill many times, but it is very important to the teacher. TinCan: Okay, so in that case, it sounds like there’s a problem with SCORM not having a skill model or competency model that is helpful to use to track specific skills and not just an overall score for the course. José: It depends on how to issue learning across specific levels, programs in competencies, and kind of things. TinCan: You also mentioned the ways that teachers want to interact with students and the fact that SCORM has been intended for individual training, so I imagine there is also interactions between students you want to capture somehow, is that the case, and can you go into more detail on that? José: I think the social interactions between parents and students, they have a different course and track the final score. Then we get, with individual parents and teachers, students shouldn’t track together in one, necessarily with SCORM standard. Many times, the teacher wants to change, to integrate the course with mobile, integrate social with the course, and then would be able to track this kind of behavior. But the teacher has got to have a lot of say, to change the behavior of the course, it’s a big issue. The behavior in class will change the activities on the fly, and try to add the tracking of these adjustment to a course, in a major way. TinCan: So, at the end there, you were saying that teachers want to change on the fly what activities are part of the course? Fernando: The behavior of the eLearning content in the standard is very rigid. All of the configuration parameters (score to pass, minimum score, learning paths,… ) are immovable and can’t be changed on the fly for certain users. At the end, the LMSs have to implement a lot of tricks to support this. The new version of the standard should give the possibility to change the behavior of the SCORM contents on the fly. It should do it allowing several configurations for a content inside the LMS, and not forcing to change the content, to allow a specifically behavior. TinCan: So not to actually change what the content is, but to change how the content reacts, to say that, okay, based on my assessment as a teacher of how the student has performed, I want the content to react differently, I want to have influence over it, but not necessarily swap it out with something completely different? Fernando: To give the teacher the possibility of the ability to change the behavior of the SCORM package on the fly. So I mean, you have a SCORM package with 2 SCOs, and the content establish a path that forces the student to complete SCO1 and after that SCO2. What happens if a teacher wants to change this order? It’s important to give the teacher or the administrators the ability to change the behavior of the content. This is applicable to the different configurations, for example to the “passing score”. Why isn’t there the possibility to have different “score to pass” for the same content in different environments (learning plans, learning modules, …)? Nowadays if we want to do that we are forced to upload this SCORM package twice with different configurations. This kind of tricks has to be done because of the lack of features in this SCORM standard. 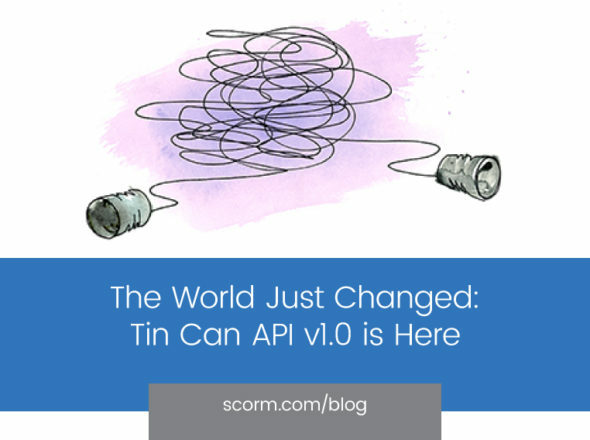 TinCan: What did you say was the consequence of the lack of these features in the SCORM standard? Fernando: The SCORM standard (1.2 and 2004) doesn’t support having more than one configuration for a single package. This situation force LMS developers to implement tricks over the standard to allow these situations. In addition, in previous versions of SCORM (like SCORM 1.2) many of the behaviors always depend on the LMS, for example the score rollup for a multiple-SCO package. At the end, the LMSs are always conditioned by the lack of well-defined features in the standard, the standard is not complete. There are a lot of things that have to be done inside the LMS or with tricks over SCORM to support a lot of features. TinCan: So because the standard doesn’t define any way for the teacher to interact with students, then basically they can’t do it, and there is no way to add that behavior in without breaking the standards, somehow. Is that right? José: For example, the migration of the tracking — if I have an LMS, I have content on the LMS, I use an interaction with the content, I use the tracking, it’s very difficult to move this tracking to another LMS, because we the construction of the content is very different on one LMS than in another LMS, but to have a standard to export the tracking between one LMS and another LMS is very useful to have. TinCan: So the LMSs are only really required to store data during the runtime and then to report back to the runtime, but they don’t have requirements of what they keep permanently and what they report on, and therefore there isn’t consistency across them, is that what you’re getting at? Fernando: Yes, I think it is something that could be assumed by the standard. To define how the data is stored, exported and imported. It is something we are suffering repeatedly. Okay, I have my company, I have a school, I have these scores with users with this tracking. How can we move this tracking between one LMS and another?. This is something that we have to do, understanding the way that each LMS calls another. I think this is something that we should include in the standard. For example, in schools there is a standard that allow us migrate data of the students between the schools: SIF. We need something like SIF for SCORM. TinCan: So, would this be more used to switch from one LMS to another, basically as a conversion, or would you have maybe a central LMS keeping track of tracking done by LMSs at individual schools, and reporting on it all? José: We do listen to teachers who maybe have different activities that are tracking from every LMS, and the standard will be able to mobilize this kind of behavior. Then it would be very easy to to track back, the remote tracking at any time. So when the system needs to create, to track different metrics and import the results into the LMS, I think that would be good for the future from SCORM. Fernando: There is no way to relate it to different SCORM packages. If I have a SCORM package to be delivered to a computer — the goal of this content is to be delivered from another platform, for example, to home. There is no way to make the tracking. I have content, and two versions of it: one for mobile and one for a computer. It can be, to have a feature, that allows me to mix the tracking of these two content into one tracking. TinCan: Right, so when you report on it, you don’t care whether a student took one version or another, you just care — you want to treat it as one course for tracking purposes? Fernando: Yes, to have the ability to establish a relationship between the two contents. TinCan: That’s something I would say some LMSs provide; you think there should be a standard way to define that, so that any conforming LMS would treat it as one course. Fernando: Yeah, because you have the manufacturers of the LMS, they are always forced to do tricks to do that. TinCan: But then, you need the administrator to define that they’re the same as opposed to some meta-data to indicate that they’re the same? José: Yes, because now, we have a problem with the content for the teacher, and for the students. We have two different versions of the content, but with the same goals. So is there a way to understand or to detect if the content is launched by a teacher or is launched by the student, and to mix the tracking — that is very important. TinCan: So now, when content is launched, the content gets from the LMS the learner name and learner ID, but you also want the content to get the role — are they a teacher or student? Maybe — any other information like that you think the content should get? Fernando: Okay, but the content gets the learner information from the LMS, and the learner information — I think, I am not sure, but it is only the name, the email address, the language, but the content has no standard way to tell if this is the teacher, this is the student, if this is a manager. That would be on the profile, could be integrated with the content, our content-model, by the standard. The standard, there is only users, they are users, but no profiles. TinCan: So what you want in the profile, to say — are they a student, are they a teacher, what else would be in the profile? Fernando: I think, the working condition of the different profiles are not always related to content — but always, a teacher, or manager, or a student, maybe; but to have a simple way to tell students from teachers. I think that’s the distinction in the profiles, who enters the content, are important. José: In the management, even the relationship between different packages, because actually, you can get information about the student’s level, for example, and relate it to be managed by the content. The content, actually, what we have to do with the LMS administrator, or learning manager, so sometimes you just create a different equation of courses and you enter — the content manage the student profile information. Their level, and this kind of information. Fernando: The content part, where communication is done with the LMS. The teacher: they don’t need tracking. But maybe they need to know how the tracking is done. The students have to give tracking to the LMS, so again, the profile has different goals, for different users. And the other things we are saying, is that it could be even that the content has the ability to interact with the LMS to know, the user has this level of skills, so I am going to show the content in a specific way for this person. TinCan: So, role — are they a learner, teacher, and then skill-set — what do they already know how to do? José: That’s it. But we are expecting a lot for SCORM. Because not many of these things are done by the LMS. But the main goal of SCORM is to have a standard for all the learning interactions. So I think this is now the learning is always modeled by skills and competency. So why doesn’t the SCORM standard support this new way in e-learning. TinCan: How do you think e-learning should and will change in the next 5 – 10 years? José: I think not only content, but also applications that can track learning and learning progress into an LMS from any device. And also providing the right content to the right people, in general, in learning to provide the right learning, from the right moment, more teachers could learn to. As a solution they are expected to learn, but also for teachers, and people who want to create learning on the fly, using teaching from the web as you can see in the social networking systems. But, any moves to create learning content, that should be intended for any specific people. Fernando: I think to have the ability to have in our main server, to be able to track this content in the LMS no matter where the content is stored, I think that is big. For example, we are always working with proxies, working with cross domain tricks, working with applets. I think now with the new technology on the web, I think that SCORM has to be intelligent to know this, this is very critical.